Taylor Gallegos is a painter specializing in murals and studio painting. His work focuses on unity, connection, love and creativity. As a professional artist his work has ranged from large-scale murals to portraits to abstracts in the studio to live art, mostly in the fields of painting and drawing with acrylics and oils. 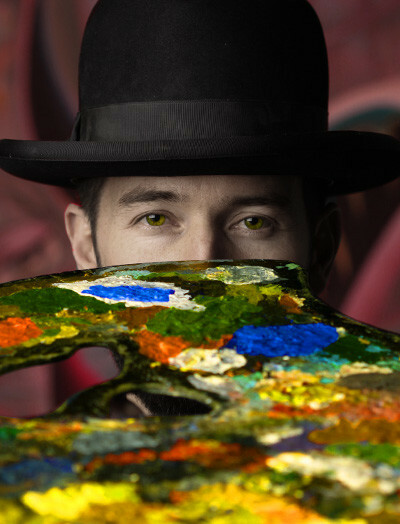 His work with live art has taken him on tour with musicians and has developed into a business venture in the world of weddings called Live Wedding Art. In recent years his studio art has developed a focus on environmental and philosophical concepts stretching into the Life series and through the Meditations and Abstractions series’. Taylor is currently living and working in Southern California and is originally from Boulder, Colorado. He received a Bachelor of Fine Art from Colorado State University, and during that time studied abroad in Castiglion Fiorentino, Italy. 2012 50 Barrels Winery, Oceanside, CA. 2011 Capitol Hill Mansion, Denver, CO.
•News clip from NBC Anchorage, Alaska on my recent mural "Life Enlightened"